Part 1 explored the connections between talking drums and information theory. In Part 2 we look at how early human information system engineers in Africa developed classification and communication systems which reflected the inherent symmetry in nature. We also show how those earliest IT systems served as the foundation stones for the binary number system at the heart of all of today’s digital technologies. The call and response initiated by nature’s symmetries is the timeless dance subatomic particles, atoms, molecules, materials, cells, organs, organisms, people, communities, nations, planets, stars and galaxies perform each moment! knowledge about the working of natural things was gathered long before recorded history and led to the development of complex abstract thinking, as shown by the construction of complex calendars, techniques for making poisonous plants edible, and buildings such as the pyramids. However no consistent conscientious distinction was made between knowledge of such things which are true in every community, and other types of communal knowledge such as mythologies and legal systems.Before the invention or discovery of the concept of “nature” (Ancient Greek phusis), by the Pre-Socratic philosophers, the same words tend to be used to describe the natural “way” in which a plant grows,and the “way” in which, for example, one tribe worships a particular god. While unpacking all of the various misunderstandings, deliberate distortions that have occurred over the last 500 years is beyond the scope of this post, it is important to identify and correct the unscientific notion that early human thinkers were rooted in and blinded by religious views. Effective systems of classification were essential to survival, preceded religious use and continue to be woven into belief systems. Just because NASA referred to man’s first Moon mission vehicles as Apollo didn’t mean they weren’t capable of distinguishing the spacecraft from a deity or were not scientific. Similarly today, China’s moon spacecraft Chang’e and rover Yutu are named after the moon goddess and her pet rabbit. When Yutu started malfunctioning, scientific diagnostic procedures commenced. When it appeared that the rover might not recover, an anthropomorphic message from the rover was sent out by officials. But I digress. From pre-dynastic times, the Medu Neter(Egyptian hieroglyphics) provided an extensive database of flora and fauna derived in large part from gestures. These dances reflected the recurring theme of symmetry pervasive throughout nature. Symmetry includes common dualities like day and night, hot and cold, dark and light, up and down, left and right, front and back as well as more specialized meanings in physics. Nobel laureate Phil Anderson once said “It is only slightly overstating the case to say that physics is the study of symmetry”. The movement-stillness/left-right,up-down of the dance became the sound-no sound of percussion. High and low pitch sounds emanating from different body parts, the ground, rocks, trees became accents, annotations of the movements. This was before verbal languages took form. We know that drums were without a doubt the first manufactured instruments. It may very well be that talking drums developed in parallel with or even preceded verbal languages in some places. Regardless of when they were first created, it’s clear that they were giving expression to an existing gesture/dance language. We know that this database existed in pre-dynastic Egypt at least as far back as 4000 BCE. It was the google-like, real-time, location-based knowledge repository of its day and found expression in the geographical-political life of the nation as well as within the structure and organization of the various libraries and temples. We can thank the 25th Dynasty(approx. 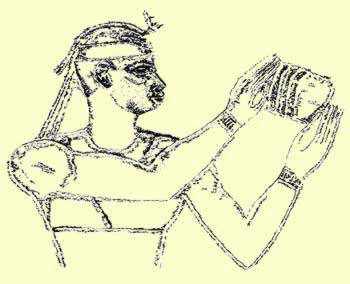 700 BCE) Pharaoh Shabaka for recognizing and acting to preserve what he recognized as vital, ancient ancestral knowledge. 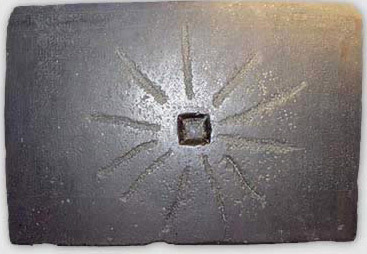 The Shabaka Stone provides us with a clear record of the ancient origin of the previously mentioned Roots of Digital Technology which Leibniz recognized as ancient in the 17th century and Stephen Wolfram is applying today. This science known as the Memphite Equation which relates all phenomena in the world to the interactions of two sets of symmetries. In Greece a watered down version of this became known as the classical elements and provided a foundation for students of alchemy such as Leibniz. In the centuries since then we’ve seen incredible advances increasingly specialized fields of science but at cost. For the past half century there’s been a trend toward more unified approaches particularly those where information plays a central role. Stephen Wolfram’s computational knowledge is one such approach.